The Legend of Zelda Zone is a DLC level in Sonic Lost World that is exclusive to the Wii U version of the game. It was released as a free download on the Nintendo eShop on March 27, 2014. In this Zone, Sonic is dressed as Link, the main protagonist from the Legend of Zelda series of games, while Rings are replaced with Rupees, the currency of the Zelda series, which turn into saved Animals after being collected. As there are no rings, Sonic instead has three hearts worth of hit points that decrease as he takes damage. By opening treasure chests scattered throughout the Zone, Sonic can find Heart Containers which will increase his maximum hit points by one heart, and Fairies will refill Sonic's hearts when found. The Zone begins in an open field resembling Hyrule Field that Sonic can freely roam around in and find Rupees and a variety of features and references from the Zelda series, including Deku Scrubs that will fire nuts that can be kicked back, Cuccos that will summon the Cucco Revenge Squad to retaliate when attacked, Gossip Stones that react differently to different attacks including the Black Bomb Color Power, Hyrule Castle which can be seen in the distance, and Link flying on a Crimson Loftwing. By luring a Bomb Badnik to a certain wall, the player can advance to a dungeon like those featured in the series. The second half of the Zone's design is laid out similarly to Windy Hill Zone 3 in that Sonic must travel through a gravity-defying tube. Obstacles and enemies that Sonic will have to watch out for include Gorons that will roll toward Sonic like boulders, Stalchildren that will emerge from the ground to swarm Sonic, and Keese that fly forward in a straight line. At the end of the dungeon, Sonic will find the Triforce, ending the Zone. Like all DLC levels, once The Legend of Zelda Zone is completed, it will disappear from the World Map. It will reappear after the player scores another 100,000 points. The songs played throughout the Zone are both remixes. The field area's music is a remix of the series' traditional Overworld theme, while the dungeon area's music is a remix of the dungeon theme from The Legend of Zelda: A Link to the Past. The Black Bomb Color Power can be used on a Gossip Stone, which will make it blast off like a rocket similar to when a player uses a bomb on it in some of the Legend of Zelda games. 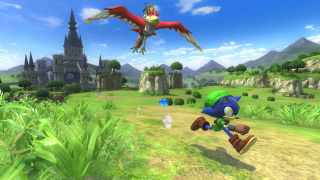 Sonic has previously crossed over with the Legend of Zelda series in Super Smash Bros. Brawl. This page was last edited on 8 April 2018, at 07:49.